We can conclude from this comparison that the larger size of the UDOO X86 is going to be problematic for some projects and a non-consideration for others. Since the Raspberry Pi is the size of a credit card, having a microboard the size of 2 credit cards is still quite small but for projects that are very small it’s going to be too much. Clearly the UDOO X86 is massively expandable and far more powerful compared to the Raspberry Pi. However, that does not automatically make it a better choice for a project. Let’s compare and contrast some general pros and cons of the board. Price – WAY more expensive than a Raspberry Pi — I bought the 4GB model with the built in 32GB eMMC storage for around $174 and I could have bought 5 Raspberry Pi 3s for the same price! Even the cheapest model with no built in storage is $125. The UDOO X86 simply cannot compete on price with the components and power it has. Size – It is literally the size of 2 Raspberry Pi 3’s stacked side by side. This is a potential dealbreaker for certain projects that may require a smaller form factor. WiFi and Bluetooth – The UDOO X86 does NOT come with free built in WiFi/Bluetooth and is an add-on that costs $16.90 from the UDOO ordering site. This is especially relevant for some projects (especially cost based ones) since the Raspberry Pi 3 and Pi Zero W both come with built in WiFi/Bluetooth for free and won’t benefit from the Gigabit ethernet controller. 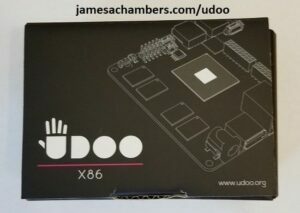 The UDOO X86 is a fantastic board. The major question for most readers though will be is it better than the Raspberry Pi? The answer to that question is that it highly depends on what you are doing. 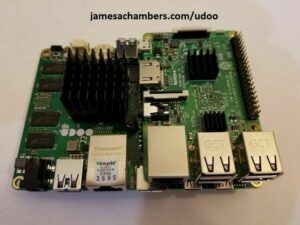 I am going to write an entire article on which projects will make more sense to build with an UDOO X86 and which projects would be better suited with a Raspberry Pi. Stay tuned! Raspberry Pi 3 NES Classic RetroPie Build < $100! Kali Linux 2017.1 + Raspberry Pi 3 + RPI 7″ Touchscreen = Plug and Play!